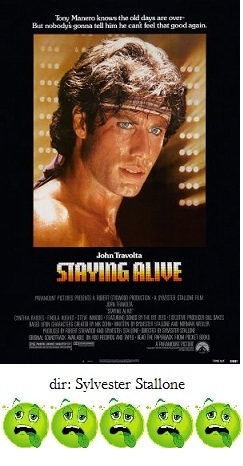 I'm not sure whose decision it was to hand the writing and directing duties for Staying Alive, the sequel to the immortal Saturday Night Fever, to Sylvester Stallone of all people, but that decision was an abysmal one. Throughout Staying Alive, it becomes increasingly clear that Stallone had probably never actually watched Saturday Night Fever. Worse than that, it's clear he never saw a Broadway musical, either. The plot here once again involves the character of Tony Manero (John Travolta, reprising his iconic character) and his new career as a featured dancer on Broadway. But the main crisis in the movie involves whether he'll stay with dependable, sweet Cynthia Rhodes, or get ensnared with successful, snotty Finola Hughes. This is the very definition of underwhelming. The biggest problem with the script, aside from the plotless romantic triangle, is the characterization of Manero, himself. In Saturday Night Fever, he was a tough, determined, three dimensional character who we wanted to see break through and succeed with his passion for dancing. But now that he's left the discotheques behind in Staying Alive, he has been turned into a thoroughly unlikable and egotistical meathead who is just this side of being mentally challenged. Truly, this guy is a moron. But in reality, Staying Alive will either live or die because of the music and the dancing. It dies. Boy, does it ever. You see, Tony Manero does land a primo spot in a Broadway show, but this show is so unlike anything that has ever been, or ever will be, brought to the stage. The show is called "Satan's Alley," and as best I can make out, the whole thing revolves around dry ice, strobe lights, large metal, jungle gym-type structures, and Manero running around in a frenzy wearing nothing but a loincloth and a headband. But it's a wild success, natch. As far as the music goes, there are a few nostalgic Bee Gees tunes, but the less said about the extensive number of dreadful songs written and 'performed' by Frank Stallone, the better. The year 1983 was a pretty dire one when it came to the number of hideous sequels that graced the screen. And to call Staying Alive the worst of the bunch, which included such 'classics' as Porky's II: The Next Day, Amityville 3-D, Jaws 3-D, The Sting II, and Smokey and the Bandit 3, is certainly saying something. But I'll go ahead and say it.